So I’m back to making cocktail posts, I’ve actually been exploring a lot of new drinks but I’ve not been thrilled with the photographs. But it’s just become time to post another recipe. This is one I have worked on myself, and it’s really simple and not super special or anything but I made it. I am focusing on fruit based drinks, spirits, liqueurs this year for trying new things. That’s because I’ve limited funds and when I buy a couple of these bottles I have to find lots of ways to use them. In the fall I made a huge batch of orgeat syrup. And I realized I have to find ways to use it other than in Mai Tai’s. Mai Tai’s are a favorite of mine and I couldn’t really do a more perfect post than this one. And it has a photo by my old friend Tony Cenicola. But I digress, I realized that I had a huge amount of orgeat (which btw I made with this recipe here.) And I knew orgeat is good in a Japanese cocktail, so it goes well in brandy and cognac. But I only had apple brandy and I knew I didn’t want a drink as sweet as the traditional Japanese cocktail. 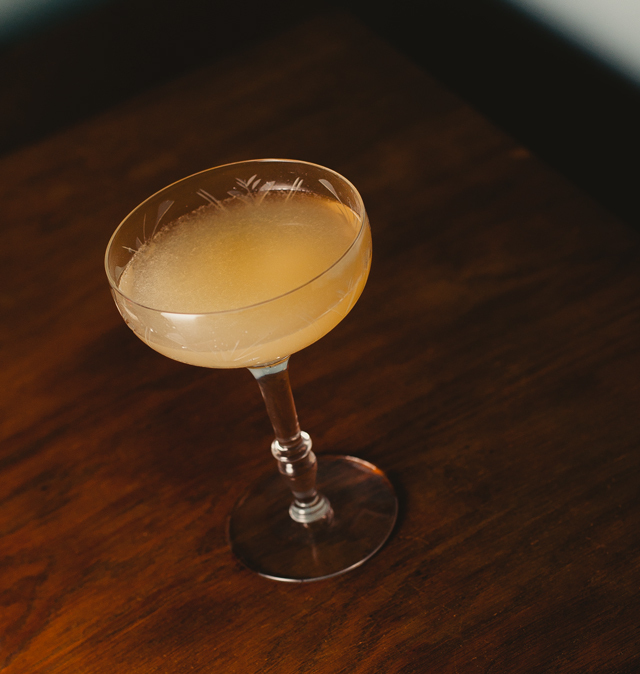 So I came up with this, which seemed like it was in the family of the Side Car, the Jack Rose and the Japanese cocktail so I called it the Go-Kart. For this drink you need either an American apple brandy or Calvados, and it shouldn’t be an expensive Calvados, one made with apples only and no pears. I’ve made this drink with two kinds of the more alcoholic apple jack too. But it’s more got more of a fruity apple flavor with something like Laird’s 7-1/2 year brandy or Calvados. The Laird’s aged stuff is not always around but you can usually get all kinds of Calvados. I made this one with some Groult Pays d’Auge, which is 3 years old made of apples only and around $30-$35. It is nicer with an older apple brandy, but price can be an issue of course. Shake or stir with ice as desired, strain into a chilled glass. I’ve tried numerous bitters, every one in the house, in this drink. All of them were good, but many overpowered the apple notes, which was surprisingly easy to do. The rhubarb bitters has an acidic cherry brightness going for it and it works so well with the apple, and the natural slightly cherry taste of the almonds that make up orgeat. I liked that there wasn’t a dominant spice taste, which stands up better in a whiskey drink. I wish I had some stem-on cocktail cherries, I’ve vowed not to buy anymore of the artificially colored bastards. I meant to make my own last summer but laziness and busted brokeness took over. A Luxardo cherry is delicious in this but it’s kind of ugly. So this is lacking a garnish. An apple slice just seemed really cliche. Anyway this is tested on friends and paramours and gets a thumbs up.